I am a 31 year old engineer living near San Francisco, CA. I am a recent graduate of the Rochester Institute of Technology where I studied Information Technology, with a concentration in Database and Interactive Multimedia and a minor in Economics. In 2007, I participated in the Google Summer of Code and was one of 900 students from around the world payed to code open source. My project was working to add SQLite support to Gallery, the most popular PHP photo album application. I have won several awards for web development projects I have been involved in. On this page you can find details, a copy of my resume as well as contact information. Experienced Web Application Programmer with a proven track record of designing and implementing interactive online solutions from the ground up to solve business problems. 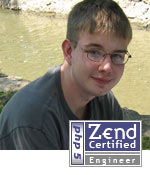 Certified PHP Engineer with over 5 years experience in PHP/MySQL designing data driving applications. Database Modeling and DBMS administration experience with a number of databases including MySQL, Oracle, SQLite, MSSQL. Used tools such as SVN Revision Control, Code Collaborator, and PHPUnit to work with open source developers around the world and develop/test structured, object oriented PHP Code. 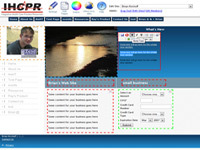 Designed and developed a custom Page Creator application used by the company to provide small companies and individuals web sites they can edit themselves online. Solution has allowed the company to reduce site development time from weeks to days, provide flexibility to our customers and increase sales over 300%. Created and expanded our school website using ASP and Access Database technologies to create a content management system. A merit based scholarship that recognizes an outstanding undergraduate student in the Rochester area with leadership and thoughtful vision in the eBusiness area. The award sponsored by Cable and Wireless recognizes students for creating award winning educational websites. Our proposal won first place in the New to Net category and received a cash award as well as a chance our proposal at the awards in London. Concentrations in Database Modeling/DBMS Architecture and Interactive Multimedia Development, Minor in Economics.